Ingredients: Cannabidiol (CBD), Olive Oil and low concentrations of Cannabinol (CBN). Purchasing this product will earn you 350 Greenbucks! Cibdol CBD Oil 3000mg 30ml is made from some of the European Union’s finest organic grade hemp, grown without pesticides or toxins. The CBD that is extracted from these plants is pure and effective and is easily one of the best high-end CBD products on the market today. Combining the organically grown hemp with high tech modern and very sterile scientific processes produces a CBD Oil that can easily be lauded as one of the best. All of Cibdol’s CBD Oils are 100 percent natural and organic, and zero growth hormones are used in the production ensuring you a high-end product just as nature intended. CBD or Cannabidiol is one of over 100 compounds found in cannabis that belong to a class of molecules called cannabinoids. Of these compounds, CBD and THC are usually present in the highest concentrations and therefore the most recognised and studied. The form of cannabis used is industrial hemp, with high levels of CBD and next to zero levels of THC (<0.05%). CBD is a non-psychoactive cannabinoid with numerous reported medicinal benefits. Studies have found that CBD has anti-inflammatory, anti-oxidant, antiemetic (reduces nausea and prevents vomiting), anti-depressant and antipsychotic properties. CBD also acts as a natural painkiller, as several studies have shown that CBD activates the same brain areas as opioids, exerting an analgesic effect. Studies also indicate that CBD may cause anti-cancer effects by various mechanisms, including induction of cell death (apoptosis), inhibition of cell growth, and inhibition of tumour angiogenesis, invasion and metastasis. As well as being naturally grown, the hemp used in Cibdol production has also been selectively bred to ensure its CBD content is much higher than regular hemp plants, which boosts the power of the CBD oil and improves the body’s ability to absorb the CBD. 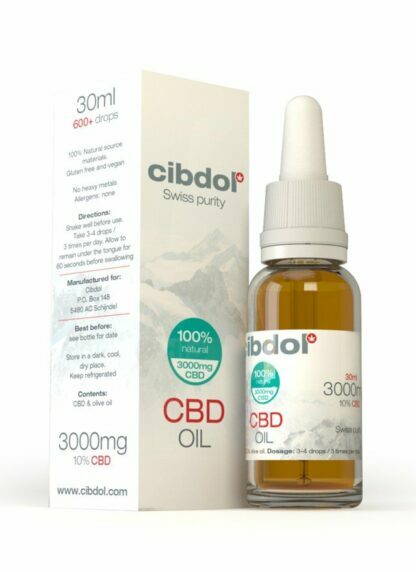 Cibdol CBD Oil 3000mg 30ml is lab tested under exacting conditions from seed to shelf for CBD content, cannabinoids, contaminants, bacteria, mould and fungi to ensure your safety and the quality of the hemp extract oil. Easy to use dropper bottle. Heavy-metal-free, no cadmium, no lead & no quicksilver. CBD Content: 3000mg (10%) per bottle. Approx. 600 Drops Per 10ml Bottle. Sample Aspects: Very dark green, pungent aroma. Store out of direct sunlight and in the fridge. Made in a Swiss laboratory. Cannabidiol (CBD), Olive Oil and low concentrations of Cannabinol (CBN). There is a lack of research to support safety if pregnant or lactating. Take 3 – 4 drops under the tongue up to three times a day. Cibdol CBD oil comes with a dropper bottle so you can dose it quickly and exactly how you want, depending on your personal CBD needs. Use within 12 weeks of purchase. Cibdol CBD oil is an all-natural perishable product, and it is recommended that you store it in a cool dark place, away from direct sunlight – such as in a refrigerator. For more information about CBD, check out our Ultimate Guide to CBD article. For information about the Health Benefits of CBD, check out our Health Benefits of CBD article.